The Task Force on Free Expression held one of three open meetings on Sept. 27 to discuss a set of principles aimed at guiding free speech and expression on campus. The three-page document, available at the event and released through email, uses broad language to reaffirm Brandeis’ commitment to free expression. The statement is the first of its kind at Brandeis. The university has a mission statement and a diversity statement which were considered when developing the statement on free expression. 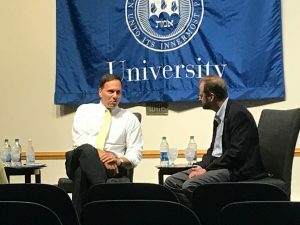 The Sept. 27 meeting was a chance for students, faculty and staff to give President Ron Liebowitz, Provost Lisa Lynch and economics professor George Hall feedback concerning the five principles. That feedback may or may not be incorporated future drafts of the principles. The guidelines have no power to enforce anything written within them. Policy is the next step, according to Liebowitz. Often, members of the Brandeis community asked questions that were less focused on the principles and more focused on how policy stemming from those principles would affect their lives on campus. Lynch, Liebowitz and Hall were unresponsive when asked direct policy questions, reiterating that the purpose of the forum was to discuss the principles on the page, not later policy decisions. “We’re here to get feedback on what these principles mean to you as they relate to policy,” said Liebowitz. One student asked how the campus would handle the cost of inviting a controversial speaker. Large scale protests against conservative speakers on college campuses have generated security costs that universities have had to shoulder. In some cases, universities have asked clubs inviting the controversial speaker to bear security costs. U.C. Berkeley, for example, spent $600,000 on security when conservative speaker Ben Shapiro spoke on Sept. 14. When they hosted Ann Coulter last April, they also spent $600,000, rather than turn away the conservative author. Lynch responded that the administration would consider the speakers on a case by case basis. Monetary and emotional costs of having a particular speaker on campus would have to be taken into account. Hall and Liebowitz agreed. Conservative author, filmmaker and speaker, Dinesh D’Souza, spoke in Schwartz Auditorium last April at an event sponsored by Young America’s Foundation. Students attending the event were not disruptive. Attendees brought up the event at the task force open meeting as an example of upholding the values of free speech and expression put forth in the task force’s principles. Two members of the task force, Jamele Adams and Stephen Alkins, did not sign the list of principles.